Get wrapped up in raptors this festive season – how many can you find near you? December is a month of finch flocks, Snow Buntings and Twite on the beach, great flocks of wintering geese, ducks and swans. It is also a wonderful time to look for birds of prey. Whether they are hunting or coming in to roost, or indeed roosting, or even just resting between meals, birds of prey are simply wonderful to watch. And now is perhaps the best time to see them in action. Just remember to wrap up warm! Unlike the Short-eared Owl, the closely related Long-eared Owl is not often seen flying during the daylight hours. Your best bet for seeing one of these handsome owls at this time of year is to visit a known roosting site where you can watch the birds snoozing and perhaps occasionally opening an eye, often deep within the protective cover of a Hawthorn, or similar dense bush. Birds may roost communally and you could see several at once at some sites. Long-eared Owls are very vulnerable to disturbance, so only visit sites where you can watch the owls at a respectful distance where you will no cause disturbance. Arguably our most beautiful bird of prey, the male Hen Harrier has a ghostly pallidity which seems to illuminate the frozen winter landscape with a cold light. Pale grey with jet black wing tips and white rump, it is almost unmistakable. Females and younger birds (known as ringtails), are brown and streaked with long barred tails and an obvious white rump. Hen Harriers quarter low over rough grassland on wings held in a shallow V, looking for voles or other small mammals. A threatened breeder in the northern and western uplands, which comes to the south and east in the autumn and winter. One of the greatest raptor success stories of recent decades, the Buzzard is now the most numerous diurnal bird of prey in the UK, overtaking the Kestrel. The population has spread from strongholds in the west to now cover just about the whole of the country. Buzzards are the largest birds of prey most of us encounter, being solid chunky units with broad fingered wings. They can be seen gliding on wings held in a shallow V, sitting on fence posts or trees and even scrabbling for worms in open fields. This is a must-see bird this month (and every month). A flying Peregrine is a vision of pure power in motion. With long, deep-based pointed wings and a shortish tail, the blue-grey adult is a magnificent, muscular looking bird, which rules the skies with an arrogant stylish swagger. Like the Buzzard, this is a bird which has expanded its range in recent years and has embraced cities as rocky canyon breeding sites, with plenty of pigeon food. But they are also birds of wild open country, where waders and ducks are often the target species. Will one of these autumnal treats turn up on your patch this month? The bulk of the autumn’s migration rush is through. But there is still plenty of movement and action in November. Wintering birds are settling in and there are still some dribs and drabs of returning migrants and off course waifs. Here are four birds to enjoy this month. See if you can bag the lot. Never very common, this elegant wader is largely a passage bird through the UK, mainly at coastal sites, with perhaps 500 or so passing through. Some also winter at favoured sites. It is larger and slimmer than the Redshank, with a longer, finer bill with just a hint of a down curve and red only on the base of the lower mandible. The wings lack the white trailing edge of Redshank, but there is a clear white rump forming an ‘oval’ on the back. Winter birds are very pale grey with a prominent supercilium. Spotted Redshanks are often inclined to wade quite deep on their long legs. The call is a very distinctive ‘chewit’. A very scarce, bordering on rare, visitor from the east, the tiny Pallas’s Leaf Warbler is only a little larger than a Goldcrest. Similar to the Yellow-browed Warbler (which usually peaks in the previous month), the Pallas’s is even stripier, with a bright yellow supercilium, bold crown stripe and a yellow rump. The latter feature can be seen while the bird undergoes one of its Goldcrest-style hovers, in search of tiny invertebrate morsels. All divers are the sort of charismatic birds we all love to see and the Great Northern is a big one as well! In breeding plumage, they are unbelievable, but by November, most will be winter birds or juveniles, with fundamentally black and white plumage. The bill is big and heavy, the crown often looks bumpy and there is a ghost of the neck band to help distinguish smaller birds from often similar-looking winter Black-throated Divers. A few thousand winter every year off the UK’s coasts, particularly in the north. A handful also stray inland, particularly to big inland sea-like lakes, such as Rutland Water or the London reservoirs. A rare breeding bird in the Scottish Highlands, the Slavonian Grebe is also a scarce winterer around our coasts, with just more than 1,000 birds around the coast, though some areas, such as the Moray Firth or parts of the Sussex coast, have more than their fair share. Very scarce inland. In winter, this small grebe is black and white (losing the spectacular orange plumes of summer), with some similarity to the scarce Black-necked Grebe but with a straighter, pale tipped bill, less black on the cheeks and a flatter crown. Even in this plumage, though is remains a very beautiful bird. Spring has just about run its course, but it is not time to hang up your bins, yet. There are still plenty of birds on the move, and even if they are not migrating, there are lots of birds worth watching this month. 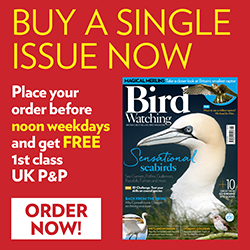 Whether they are resident species, or rare breeders or indeed birds in one of the country’s great seabird cities, there are great birds to find everywhere in June! The Honey Buzzard fits into that dodgy category of ‘notorious beginner birds’. Their similarity to the much more abundant Buzzard means this bird, with a breeding population of fewer than 70 UK pairs, is often over-claimed by birding ‘newbies’. Your best bet for seeing one is to visit a known watchpoint such as in Norfolk or Devon. They are Buzzard-sized with a distinctive flight style (without the shallow V glide of Buzzard) on long wings. A long, barred tail and smaller head give a different structure. Like Buzzards though, they are highly variable in plumage. Britain’s favourite seabird is also one of the nation’s favourite birds. Cute and unmistakable, it is a great sight to see. And summer is the best time for that, as they have now returned to their breeding burrows. At some clifftop sites they can be very confiding and let you get close up views and photographs of this most charismatic of birds. Even rarer than the Honey Buzzard as a breeding bird, with a handful of birds established in East Anglia, the elegant Spoonbill is more regular as a scarce passage bird in spring and summer, mainly around the coast. It is larger and chunkier than the Little Egret and any view of the extraordinary bill should make ID straightforward. Spoonbills, unlike egrets, fly with the neck (and bill) outstretched. They have a reputation for sleeping most of the day, which is probably well founded, but a Spoonbill in full feeding action, sweeping with that great spatulate bill, is a great sight. The Yellow Wagtail is a summer migrant, the Pied Wagtail an attention-seeking playground and supermarket favourite. But the Grey Wagtail is often forgotten about and yet is arguably the most attractive of the three. The grey part of the name only refers to the back. They are lemon yellow below with a handsome black bib and a super-long tail. Look for them especially near water, including fast-flowing streams.